I’m feeling strong again after a complete meltdown last week. I have planned my food like I am supposed to and stuck to the plan, I took the BodyBugg off my arm and stopped obsessively counting my calories, signed up for a marathon and got my hair back to the color it was meant to be (That would be platinum bleach blond), updated to iOS7, bought Knee Boots and I’m feeling like myself again. Really, I don’t have control issues! 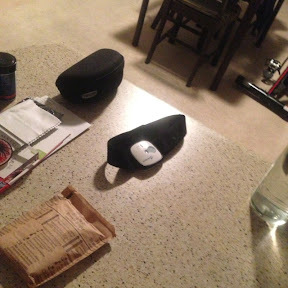 BodyBugg off the body and on the counter...indefinitely! Now that I'm feeling all better I have gotten sore again. I signed up for that running bootcamp again and he has not let me down yet. This is just week two and Tuesday afternoon we did hills, lots and lots of hill, lots of hills. We climbed Mt. Everest 10 times. Why oh why do I sign up for this!?!?! It was an awesome workout, especially since we had already run that morning. I'm not sure you can see what this is so let me explain. 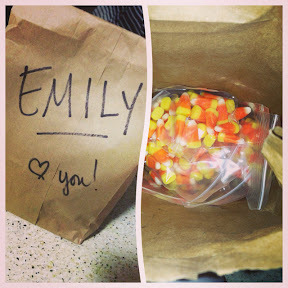 Its a bag full of candy corn, wrapped up in individual serving packs. This way I can stay true to my diet and not eat the entire bag at one time. This is so helpful to me, I can have some everyday because I can honestly calculate them into my daily count instead of 104 servings at one sitting. Food Issues: Working on it! So I had a tiny bag of Candy Corn Tuesday night and enjoyed every one! My day today started with another pretty tough workout. I had PUMP this morning and it was a touch harder than normal and then I set up a circuit for some additional calorie burn. 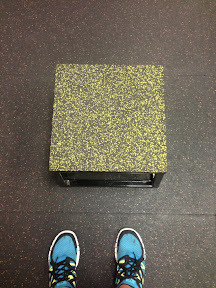 It was box jumps (you can see the video of a successful box jump on Instagram @fatgirltothin﻿), kettlebell swings, rows, jump rope, burpees, and step ups. All that after PUMP and 2000m rowing and I was so ready to be done at the gym and ready to eat some food! From this angle the box looks so small, from my angle it looks so high! My food has been on track all week. I am following the Carb Cycle plan and today was day 3 and High-Carb day. I was really ready to get some carbs in my life! I had toast with my breakfast, spaghetti for lunch and some corn chips for dinner and fruit throughout the day. 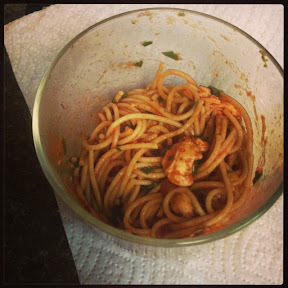 It was delicious and gave me what I needed to get through a few more days of Low-Carb. Ill explain a little more another time but so far I am liking it so no complains yet. I'm a little late to bed tonight but after a busy day Ill take bedtime before 11pm. Who's ready to do it all again tomorrow? ?